The UpStage planning meeting took place during Thursday 9th and Friday 10th January 2014 at the open source community gallery 19 Tory Street. It was attended by Vicki Smith, Helen Varley Jamieson, Anne Philpott, Vanessa Henderson, Nikos Phillips, and Dan Untitled in Wellington, with online participants including Aki, Annie Abrahams and Ken Fields. 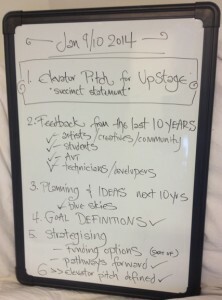 The agenda included feedback and evaluation of the last ten years of UpStage; discussion about the state of the software and how to manage a new start; and ideas for the future including artistic projects, fundraising, administration and promotion. One of the main discussion points that we kept coming back to was the need to get more people involved in the organisation and technical development of UpStage. We have a strong community of artists, but if the project is to continue sustainably, it can’t remain dependent on the voluntary efforts of a very small number of people; the community needs to step up and do things. propose your own UpStage projects: the platform is available for you to use if you have ideas, you don’t have to wait for someone else to organise a festival. For example you could curate a series of shows or events on a topic of interest to you, or include an UpStage element in a broader project. volunteer to assist with specific tasks such as: web site updating; leading walk-throughs; documentation; promotion; writing articles; testing; software development; server maintenance. fundraising: if you’ve seen an opportunity that you think would fit UpStage, don’t just tell us we should apply – offer to help make the application. 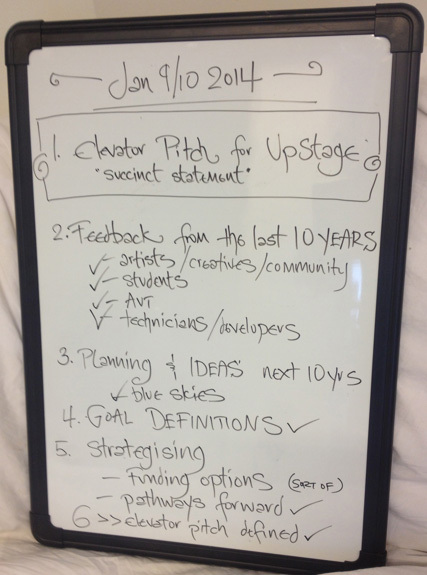 Everyone: email info@upstage.org.nz if you have ideas or proposals. Helen & Vicki – invite people to lead open walkthroughs. 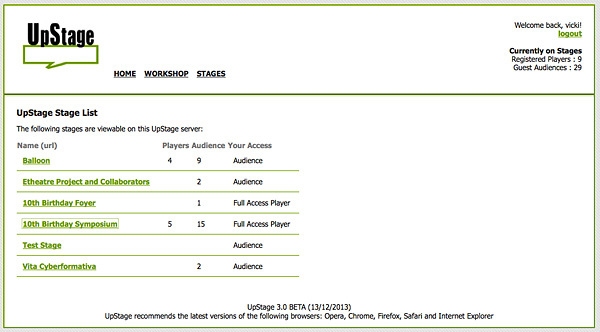 How would you describe UpStage to someone who knows nothing about it, in a few short succinct sentences? This is something we’ve struggled with throughout the last 10 years, since there are so many facets to the project and no easy way to describe what it is without actually showing people. 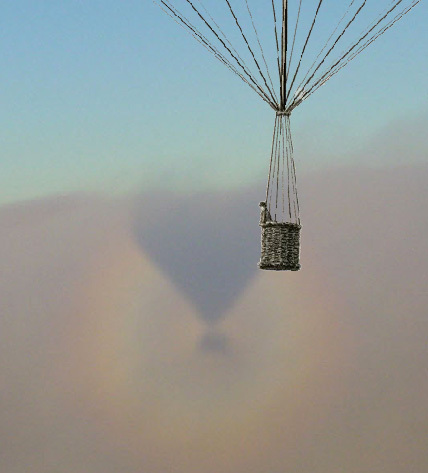 Not being able to explain it well hinders promotion and funding applications. We are working on a new “elevator pitch” and would appreciate your feedback and input. Contact info@upstage.org.nz if you can offer help or suggest ideas. Helen & Vicki to send out a draft elevator pitch to the community for feedback. The current UpStage web site was created in 2007, and is now in need of a refresh in order to make the wealth of information more accessible and intuitive to navigate. We already have one volunteer, Aki, who has offered to help with the web site so we hope to have some action on this in the near future. 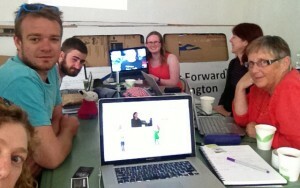 Helen & Vicki to draft a web site brief for AUT students. Helen, Vicki & Aki to look at WordPress – themes and plugins. UpStage doesn’t need a lot of money, but it does need some, and due to its virtual, global and experimental nature it is very difficult to access funding. Alternative sources of income could include a membership, ticketing for shows, venue fees and other ideas. For example, if you have a funded project that you want to use UpStage for, can you build in a fee for UpStage into your budget? We agreed to survey the community to find out what your thoughts and ideas are about generating income through the resources that we have. Vicki & Helen to create and distribute a survey. Everyone please complete the survey! Anyone who can help with funding please email info@upstage.org.nz – but please don’t just tell us that we should apply for this or that. We need you to help with the application as well. For some time now it has been clear that the UpStage application is in need of a complete rebuild. The basis of the code is now 10 years old and was initially developed for four artists to use, without knowing how it might grow. Technology has moved on a lot since 2004 and there are now many new possibilities that we would like to explore – for example HTML5, removing the dependency on Flash so that it can be used on mobile devices; an API-based approach to allow individuals to customise the application according to their needs; and integrating other input devices such as sensors. The meeting agreed that it is time to draw a line under the development – UpStage v3 will be the last version. Our next challenge is to re-engineer the whole thing, beginning with the AUT student team looking at alternative structures including getting familiar with Martin Eisenbarth’s DownStage proposal. Aki has also expressed interest in working on the code. AUT team to research alternatives including DownStage. Helen & Vicki to write software brief – input from YOU welcome!